A protest is scheduled for Wednesday against the death of two-year-old Mawda Shawri, who was hit by a stray police bullet last week. The shooting occurred during a police chase with a van operated by human traffickers. Approximately 15 police vehicles were ultimately chasing the van on the E42 between Namur and Mons in the early morning hours of 17 May. According to police, when the driver of the van began trying to ram police vehicles, an officer shot at him. The van was stopped by a police barricade and it was discovered that the toddler, riding in the back of the van behind the driver, had been hit by the bullet. She died in an ambulance on the way to hospital. A further 29 Kurdish migrants were found in the back of the van. It is now known that they were on their way to the UK. 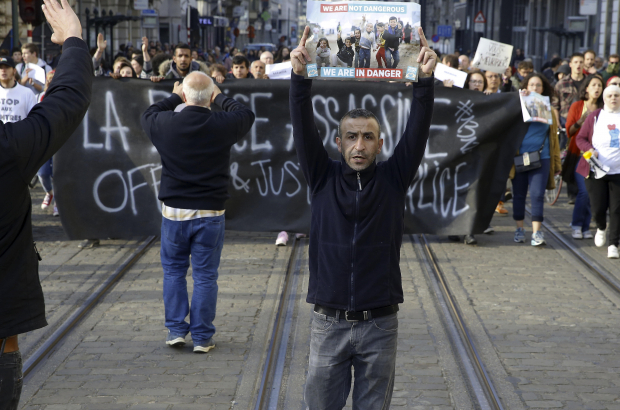 A protest took place on Friday in Brussels, with 250 people marching past the Immigration Office and the office of federal justice minister Jan Jambon. The group (pictured) demanded the resignation of migration secretary Theo Francken, whose “flawed migration policy,” it said, led to the tragic incident. Yesterday, it was reported that Mawda’s parents were held in a police cell and were not told that their daughter had died for two days. They were then told that their daughter had not died from a police bullet and then later told that she had. They now have a lawyer, who says they are demanding a parliamentary investigation into the shooting. A police investigation is underway, and prime minister Charles Michel said that an independent investigation would also begin. Wednesday’s protest, Justice for Mawda, is from 17.30 to 19.30 in front of the Justice Palace. The group Coordination Semira Adamu is organising the protest. It was formed in 1998 following the death of asylum-seeker Semira Adamu at the hands of police. A wake for Mawda will be held from 22.00 to 23.00, also in front of the Justice Palace. They entered the country illegally and refused to stop when ordered to by the police. So imo the parents/adults in the van must shoulder a lot of the responsibility for the tragic death of an innocent toddler.